This lunch is also posted over at The Little Crooked Cottage as a Literary Lunch. Head over to the fabulous blog of four children's book authors and check out the wonderful Literary Interview with Mr. Pig himself! Meet Little Elliot, the star of Mike Curato's new book LITTLE ELLIOT, BIG CITY. He is a polka dotted elephant living in a big city. Being small in a big city has it's downsides but nothing is impossible with a friend by your side. I live too far from the closest Trader Joe's to be able to go regularly but yesterday I was near one and had to stop for a few treats. Today's lunches are filled with some fun Trader Joe's finds - and that's ok since it's Friday! Disclaimer: This is NOT a sponsored post. I simply love shopping at Trader Joe's and wish I lived closer to one of their stores! SNOW WHAT written by Judy Schachner is the new exciting adventure of Skippyjon Jones. 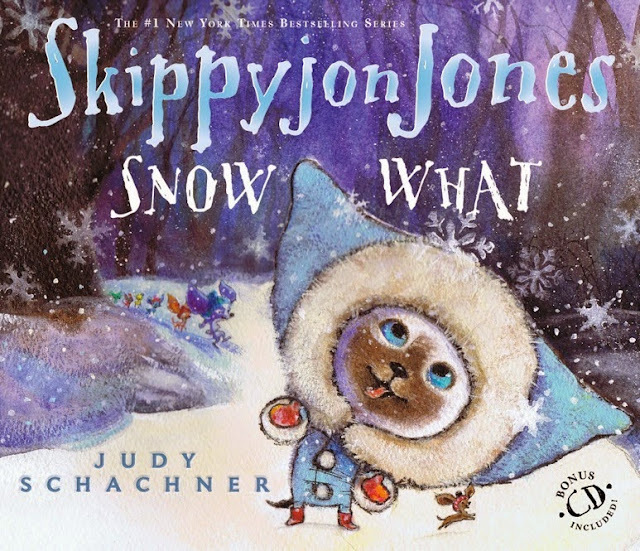 This time Skippyjon Jones heads into a magical snowy forest of make-believe. Can the seven Chimichangos convince him to wake up Nieve Que, the frozen princess, by kissing her? You just have to find out by picking up your own copy of SNOW WHAT. I love lunchboxes. Period. And I love when they make lunch packing and lunch enjoying easier. Here are a few new ones I am trying out with the kids this week and today's lunches. 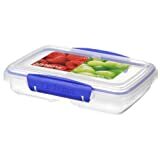 Which lunchbox is your favorite lunch box currently? Leave me a comment! I'd love to know what works for you! 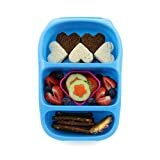 My daughter also brings a daily snack and this Sistema snack box works great for us. She loves applesauce and almost daily brings an applesauce pouch and a small dry snack or veggies. Today we packed a GoGo Spqeez Apple Banana pouch and some left over homemade mud buddies. To make lunch more fun I added a cute topper to make her smile. Did you spot the fun bento pick? I found it at bento USA and love that you can write on it with a food safe marker. 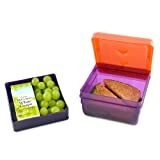 Perfect for entertaining and adding a fun element to lunch!! THE TEMPLETON TWINS MAKE A SCENE is book two of the hilarious Templeton Twin series written by Ellis Weiner and illustrated by Jeremy Holmes. If you have not read book one THE TEMPLETON TWINS HAVE AN IDEA we highly recommend you do! This book is filled with kid-friendly humor, suspense, silliness and many serious words. The narrator is as much part of the book as the reader and gives the reader a quiz after every chapter just to make sure you paid attention. This time around Abigail and John have to outsmart the Dean brothers again, rescue their father and dog and of course the important invention their father built for TAPAS. A must-read for all suspense loving readers! The Narrator's Guacamole which is mostly coleslaw (recipe in the book) decorated with a few tools one needs to build clever inventions. An apple to stay healthy and smart with a Cryptic Crossword* and Cassie, the Ridiculous Dog. A very filling ham and salad sandwich with the Templeton Twins in bread, cheese and German edible paper - I know, I know you expected beef tacos** but ham sandwiches are much easier to eat on the go! * Abigail loves solving Cryptic Crossword puzzles and this clearly stands for The Templeton Twins! ** If you read the book, you would know why. Go read the book! We really loved the blueprint inspired illustrations throughout the book and the enjoyed the details they added to the story. If you love guacamole or coleslaw and suspense, action and pop quizzes this book is for you! It was hard to put down for both me and my 9 year old! Go read it! You won't regret it! There is only one day left before Halloween and with Halloween the season of treats and goodies will begin. 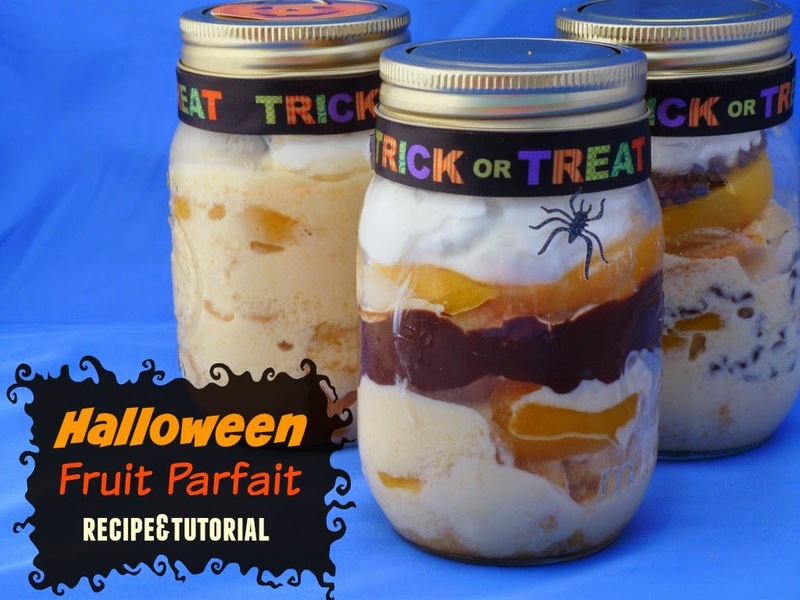 Since I love yogurt and chocolate I thought combining the two to make a delicious fruit parfait could be fun! 8 oz of mini dark chocolate chips as is or melted. First layer lady fingers into glass. Add Orange Vanilla yogurt - about 2 tablespoons. Add either chocolate chips or melted chocolate. If using melted chocolate only spread a thin layer on the peaches. Repeat until your glass is full and end with a layer of yogurt and chocolate chips. Best if refrigerated for at least one hour to let flavors combine. My entire family loves this dessert so I decided to make some to give away as well. And of course some for my kids’ lunch boxes. This post was originally posted in 2012 as a guest post. Since it has been deleted from the original blog I am reposting it on my own blog today. 2 more days until Halloween! Are you as excited as I am? I love fall and Halloween and I cannot wait to take the kids trick-or-treating! Today I am part of the annual Bento Bloggers & Friends Blog Hop. Click through to the next blogger at the end of each post and you will be able to enjoy 18 fabulous Halloween lunch ideas! I also added a fun Lunchbox Love Halloween Card to make this lunch extra boo-tiful! My kids love lunchbox notes! There is just something special about finding a little note in your lunchbox with a reminder from home. 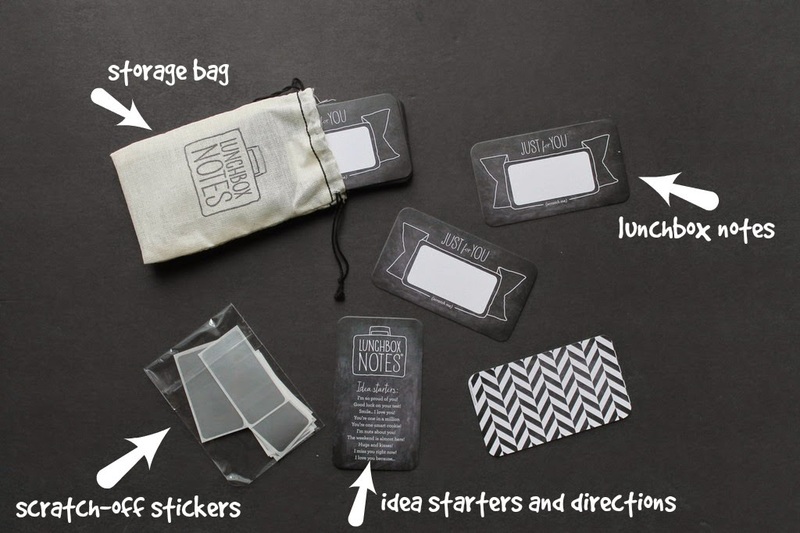 My boys especially love jokes and silly lunchbox notes and the Inklings Paperie Lunchbox Notes add a whole new layer of fun with their scratch-off stickers! We couldn't wait to try these out! a very handy storage back. Also, included were a card with directions and idea starters. 1. Write your message or draw a simple picture (like Wendolonia). 2. Cover your message with the scratch-off sticker. 3. Add a penny or something else your child can use to scratch off their message. 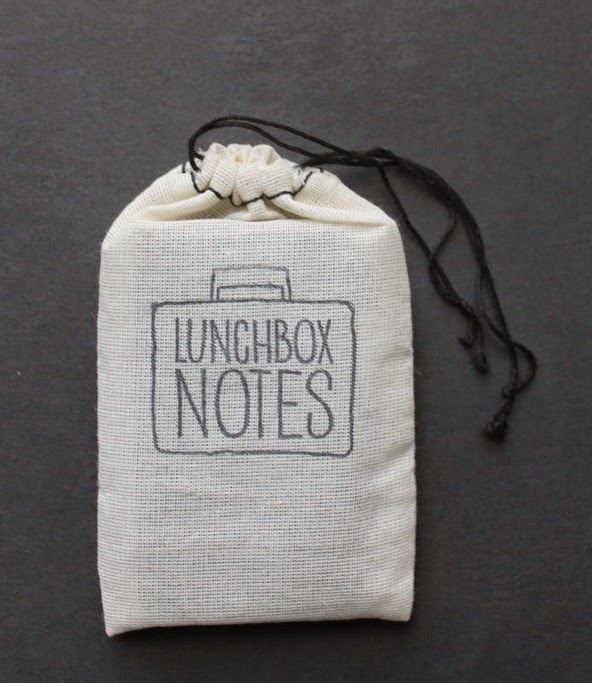 I have to say these lunchbox notes are really fun! My kids love lunchbox notes in general and we often add pre-printed ones with trivia and jokes. Recently, I started adding these pre-printed notes to my pre-readers lunch and she would thank me for them every day. One of the mornings when I was carefully choosing a card I asked her who read the cards to her at lunch. She told me that no one was reading them to her but she knew they said "I love you!" I was so touched but also realized that it would be more personal if I would draw her a picture for lunch instead of sending a written note. These cards are perfect for just that! My older kids loved the extra fun part of scratching the sticker off to find the written message from me but from now on I will draw my daughter a note. Besides that, I like that the design is gender neutral so they are great for both my daughter and my sons. 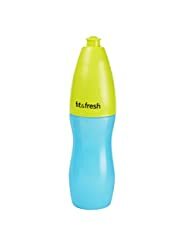 They are also age neutral - meaning both my 5 year old and my teen like the design. And if you have different aged kids you can do both: write a short message or simply draw a picture for your pre-reader! Open to US residents only. Winner will be notified via email and has 48 hours to claim their prize before a new winner is chosen. 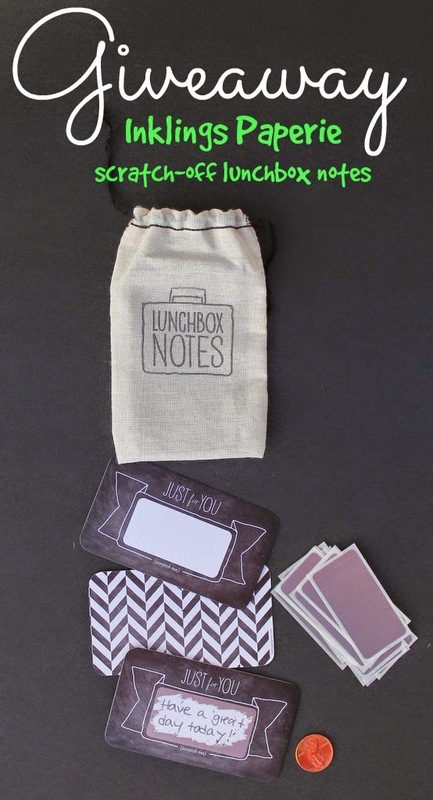 And if you cannot wait to get your own Scratch-off Lunchbox Notes, use my code "MAMABELLY20OFF" thru December 2014 to save 20% at Inklings Paperie. 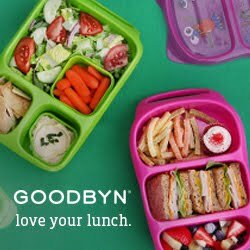 We have a new YUMBOX and my little girl is so in love with her new purple lunchbox ( a former review with tips and tricks is coming soon!). I collected all the lunches we packed this week - plus a bonus lunch from last week! !